The Samsung Galaxy Note 2 (Note II) has been another smash success for Samsung and we’re sure that many people are still hoping to purchase one at some point. Better still, it would be a great gift to give, especially as we’ve heard that a pink Samsung Galaxy Note 2 has come to light, and very timely too as this is Valentine’s Day week, but will it arrive in time? The Galaxy Note 2 is already available in several color options, Titanium Gray, Marble White, Amber Brown and Ruby Wine (not all colors on all carriers) and now it seems a Pink addition is on its way. However when we first heard of this last week many sites reported that it would be available for St. Valentine’s Day this week. Now we are only three days away and we’re not quite sure where, or if, it is available yet, apart from Taiwan. 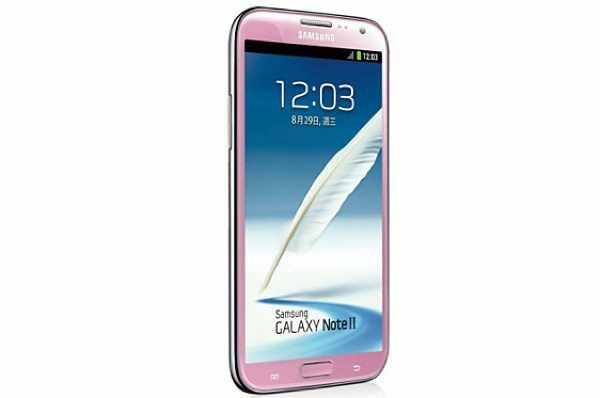 When the Pink Galaxy Note 2 was spotted on Samsung’s Taiwanese website last week it seemed a natural assumption to believe that it would be released, in most regions at least, just in time for Valentine’s Day. However nothing was confirmed about a release in other areas so we can only hope that it will come in time as we think many potential customers would really like the pink version that you can see above. If it doesn’t arrive for St. Valentine’s Day though we still think it will sell well if it becomes available in the near future. It’s really quite a nice subtle baby pink too, rather than a garish hot pink so it would appeal to plenty of people who’d like something a little different. Although it differs on the outside the specs are the same including a quad-core processor, 5.5-inch Super AMOLED HD display, 2GB of RAM, 8-megapixel rear camera and 1.9-megapixel front-facing camera. The Galaxy Note 2 also has LTE connectivity (where applicable), NFC and a 3100 mAh battery, runs on Android Jelly Bean and also totes the Samsung S Pen stylus. We’d really like to hear from readers regarding the Pink Galaxy Note 2. If you have seen it on sale in your region please let us know where you are? If not, is the pink model something you’d like if it were available for sale in your country? Let us know with your comments. The staggered color release thing really only serves to piss off customers who’ve already bought the newly redefined bland offerings early. Are they purposely trying to tell people to wait for colors to populate shelves? How many people are they really pulling in just for colors, who weren’t already interested in or inclined to buy the phone anyway? I’m a huge fan of most things that are pink. I’d definitely get the pink Galaxy Note 2 if it was available here in Hong Kong. I’m currently using the pink Galaxy S3. I am trying to wait on any color to come to Texas and verizon. My poor droid x is on its last leg. PLEASE HURRY!!!!! I really want to upgrade my mobile phone to the Note II, however my mobile service provider (Virgin Mobile Canada) does not offer this select device at all. I am willing to switch mobile service providers to attain the Note II, and would love the pink version! Please release new colour options in Canada!! !